We began the day with a delicious breakfast buffet, which included a variety of fresh fruits, flakey pastries, crusty breads, cheeses, olives, a ful bar (that’s ful with one ‘L’ – the traditional breakfast of mashed fava beans garnished with any or all of the following – olive oil, chopped boiled egg, onion, tomato, cucumber, parsley, lemon juice… Click to see a recipe for ful. ), omelettes and pancakes made to order, yogurt, cereal, fresh juices, coffee, and tea. Then we headed out for a morning of touring on the west side of the river. 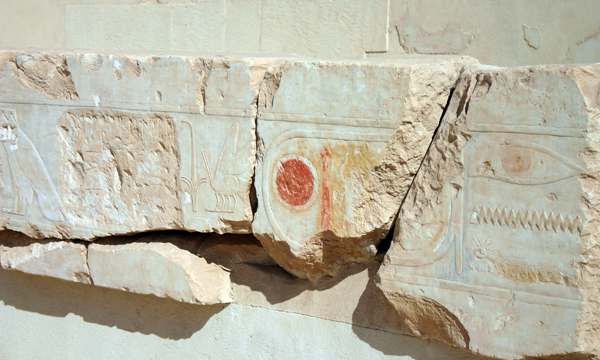 Tombs and mortuary temples are located on the west because the sun sets in the west. 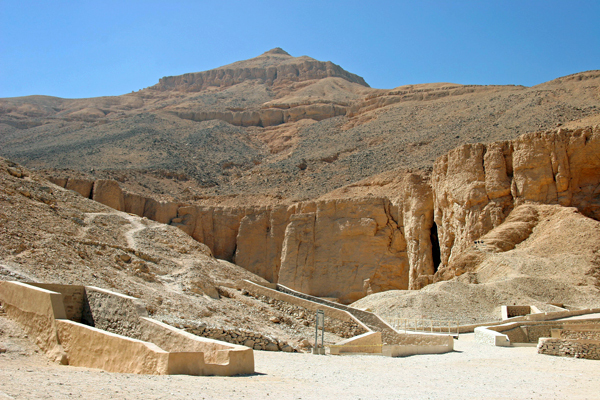 Our first stop was the Valley of the Kings, where we visited 3 different tombs, including the tomb of Tutankhamun. 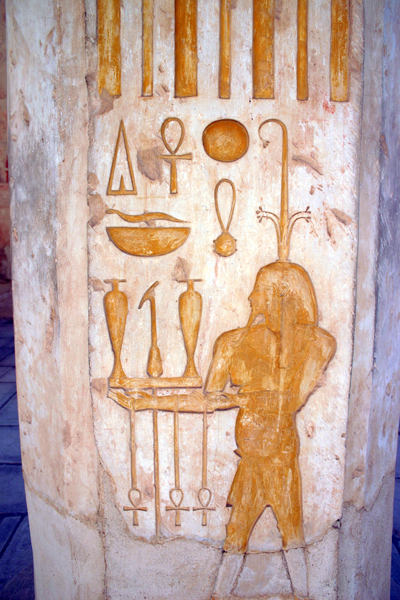 (All of his treasure was removed to the Cairo Museum long ago.) It was only 9am but already 80 degrees Farenheit outside, and climbing. Inside the tombs, it was 20 degrees warmer, like an oven, with still, super-dry air, an atmosphere I’ll never forget. In each tomb we walked down long corridors to get to the burial chambers, deep inside the mountains. Suspended in the oppressive atmosphere, the walls and ceilings are alive with mysterious, evocative paintings, almost every inch is covered. It’s an intense sensory experience, kind of mind-boggling, definitely surreal. 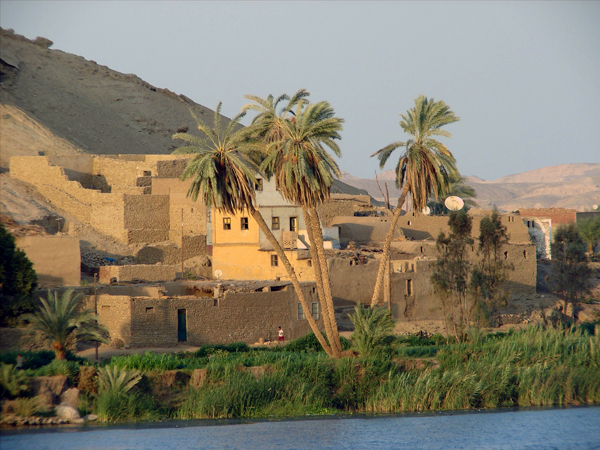 Click to read more about the Valley of the Kings. 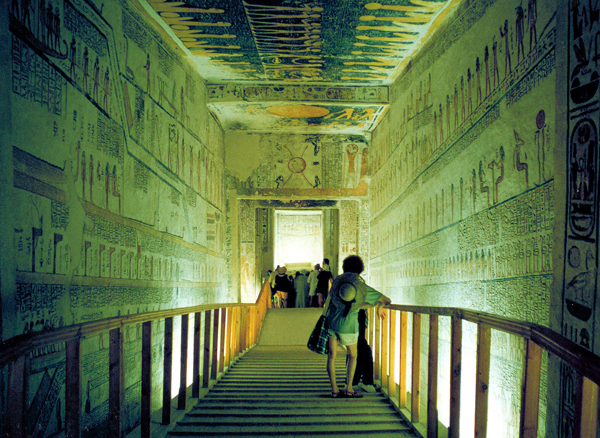 This photo of a tomb in the Valley of the Kings was taken years ago. 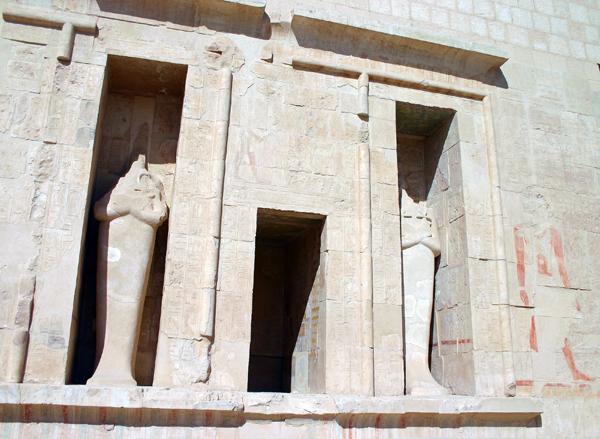 It’s no longer allowed to take photos inside the tombs. 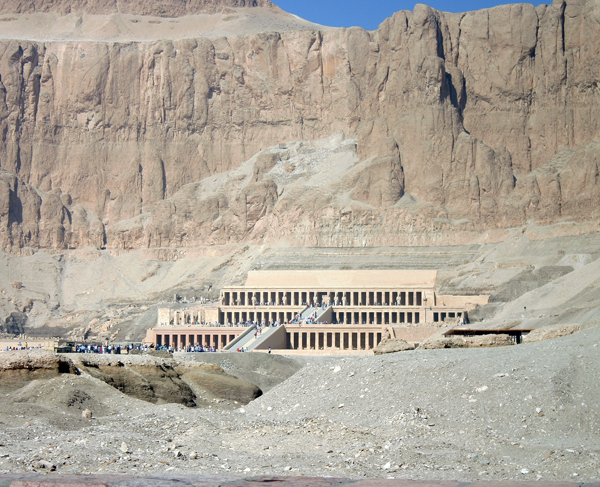 Down the road is the mortuary Temple of Hatshepsut. This was an entirely difference experience from the tombs. The temple, with its horizontal, low profile and clean lines, set so perfectly in its environment, has always reminded me of the organic, Prairie style architecture of mid-20th century America, Frank Lloyd Wright, et al. Long colonnades open onto broad terraces, pockets of stunning paint, and graceful, haunting statues. 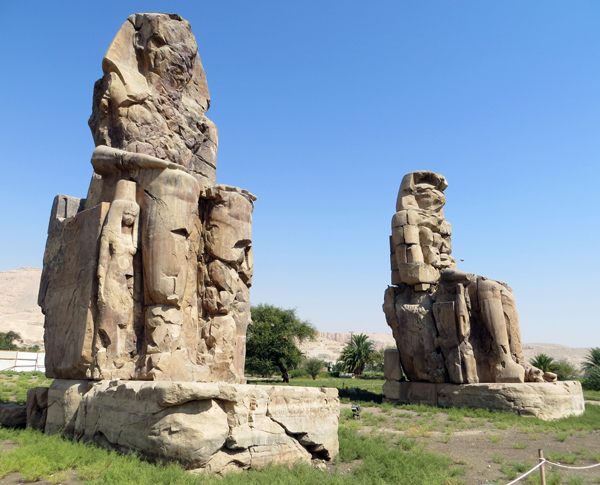 On the way back to the boat, we stopped to see the Colossi of Memnon, two enormous statues of the seated Amenhotep III. Despite a lot of damage, they are quite impressive. 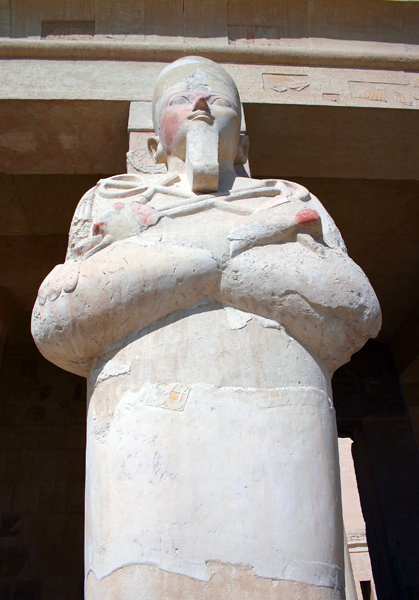 Why they’re called Colossi of Memnon rather than Colossi of Amenhotep III is a story for another time. 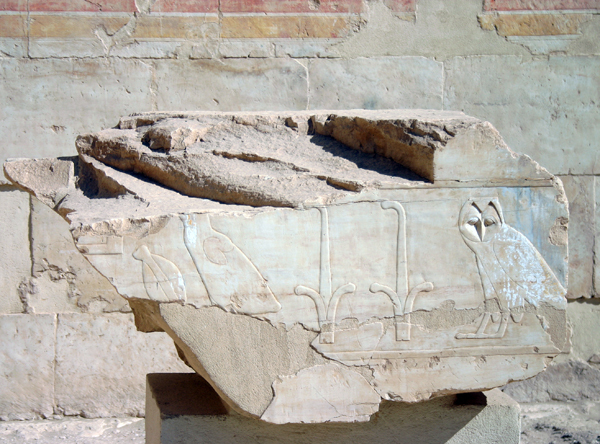 Once everyone was back on board, we set sail for Esna. Again, lunch was a formal meal served by waiters in white jackets. With my plate half-full, I was already so stuffed I wondered how I would finish, when I made the mistake of commenting that our guide’s fish was bigger than mine. I was teasing, of course, but a moment later, he spoke to the waiter in Arabic, and next thing I knew another whole fish was served to me! The only gracious response was to eat every bite of fish #1 and fish #2, as well as all the trimmings. The lesson learned was never to question the impeccability of Egyptian hospitality, even in jest. 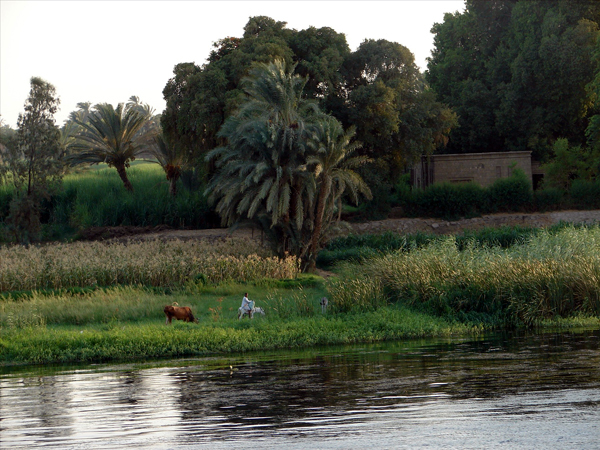 At Esna, we crossed the locks and continued sailing to Edfu. 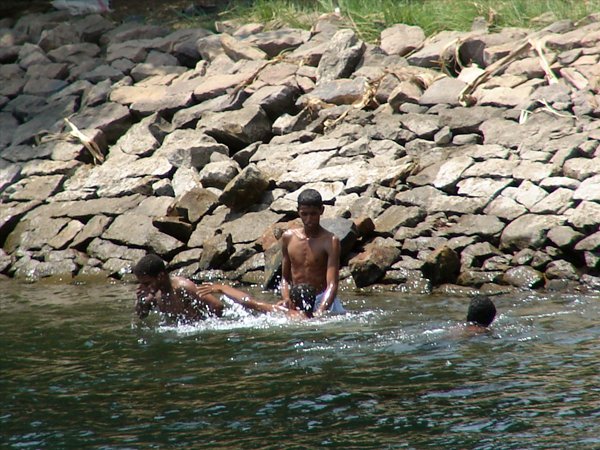 We spent the afternoon, hanging out on deck listening to music, drinking Stella beer and watching the timeless banks, where farmers worked, donkeys ambled and kids waved to us enthusiastically. Around 3:30, afternoon tea was served – pastries, fruit, cheeses, breads and, of course, tea. They’re feeding us well on this boat. The evening was pretty much a repeat of last night, a fine buffet dinner and DJ music and dancing. It’s a fun group of passengers and crew, all very friendly and relaxed. 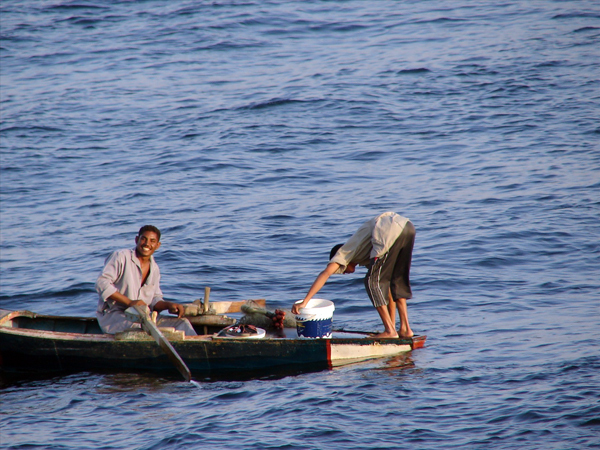 To read about Day 1 on the Nile, click here. 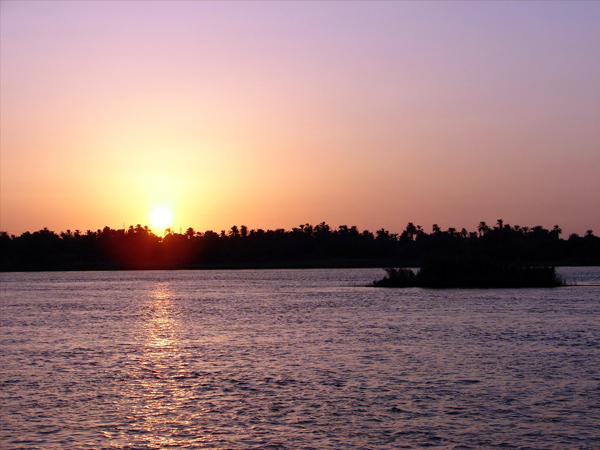 To see Egypt tours that include a Nile cruise, click here. This entry was posted in Egypt and tagged colossi of memnon, edfu, esna, Temple of Hatshepsut, valley of the kings by yalla2013. Bookmark the permalink.